WINNIPEG – Mild weather, hosting the Grey Cup, being singled out as one of the best destinations in the world to visit by National Geographic Traveler magazine, or just having a an excellent supply of terrific listings to choose from with such favourable mortgage rates, it was the first time November nudged over 900 sales in WinnipegREALTORS® 112-year history. Not surprisingly, dollar volume was at its highest level too for this month at nearly $245 million and with a month to go, it is virtually assured a new annual dollar volume record will be set around the $3.5 billion mark. November also set a record for the highest-priced residential-detached or single family property sold ever at $2.7 million. It is a spectacular home and acreage nestled along the Assiniboine River in St. Francois Xavier. November MLS® unit sales of 903 represent an increase of nearly 9% over November 2014 and are the highest on record for this month. Similarly, dollar volume of close to $245 million set a new November dollar volume record and was up 12% over November 2014. Year-to-date MLS® unit sales of 12,285 are up less than 1% while dollar volume of $3.3 billion has increased almost 3% over the same period in 2014. Listing supply continues to be elevated with 4,377 available for sale at the end of November. This total is only a 5% increase over last year but is significantly more in percentage terms over some previous years when there were well under 3,000 properties for sale. 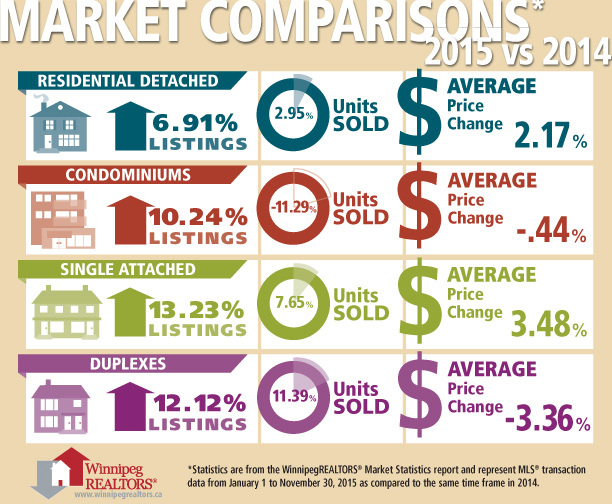 The 5 months of MLS® listings supply available at this time tilts more towards a buyers’ market. As a result it puts more of a premium on vendors to do everything possible to place their property in its most positive light to sell given the stiff competition which exists. As for the status of different MLS® property types heading in to the final month of the year, residential-detached or single family homes which represent 3 out of every 4 homes sold so far in 2015, are ahead 3% in sales activity and 2% in average sales price in comparison to the same period in 2014. The average sale price is $294,973. Condominiums which got off to a real slow start at the beginning of the year have recovered to some extent but are still off 11% from 2014. Their average sales price of $236,947 is down less than 1% from last year. Condos are the second most active MLS® property type with 12% of total market share. An affordable alternative to single family and condominium properties is single-attached. They have increased nearly 8% in sales this year and experienced an average sale price rise of over 3%. Their average sales price is $226,860. This third most active MLS® property type only captures 3% of the total MLS® market. Vacant land sales are slightly lower in activity but similar in percentage terms. The most active price range in November for residential-detached sales was $250,000- $299,999 (22% of sales), followed by the $200,000- $249,999 (18%) and $150,000 -$199,999 (12%) and $300,000-$349,999 (12%). 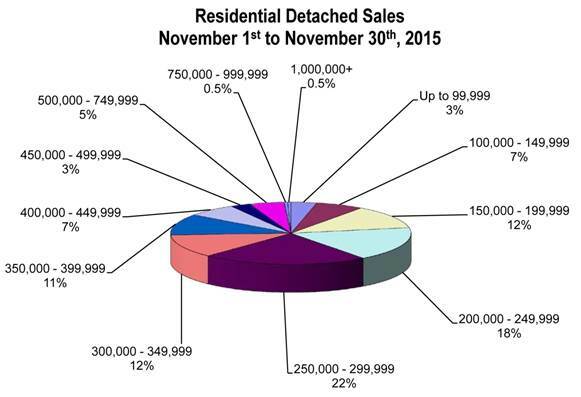 Average days on market for residential-detached sales was 41 days, a week slower than November 2014. The highest-priced residential-detached sale was $2.7 million. The least expensive sale was $49,000. The most active price range in November for condominiums was the $150,000-$199,999 (29% of sales), followed by the $100,000-$149,999 (19%) and the $250,000-$299,999 (18%). Average days on market for condos was 49 days, 3 days off the pace set in November 2014. The highest-priced condo sale was $587,932 and the lowest sale price was $101,000.